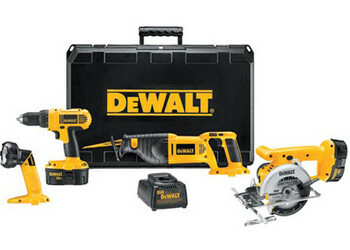 Dewalt Heavy-Duty 18V Cordless Compact Drill/Driver/Trim Saw/Reciprocating Saw/Pivot Light Combo Kit. DC759 18V 1/2" compact drill/driver with 450 in.-lbs. of maximum torque. DW936 18V trim saw with 5-3/8" 16 tooth carbide blade and rip fence can cut a "2x4" in a single pass. DW938 18V cordless reciprocating saw with keyless blade clamp allows for quick blade change without touching blade or reciprocating shaft. DW908 18V pivoting head flashlight which allows light to be projected in any direction. 16-tooth carbide tipped trim saw blade.